The trend of creating an argyle color pattern from variegated yarn is becoming quite popular, but it is not the only effect you can get from planned pooling. 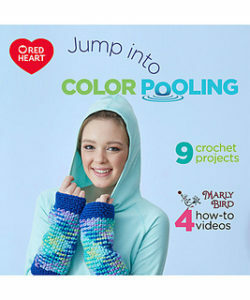 Pooling is when certain colors “stack” or “group” together from a variegated yarn, and as planned pooling might suggest, you can plan where the colors fall from the yarn and create a pattern. Usually this argyle effect is created with yarn that has a color repeat of at least 6-18” (15-46cm) and using what some call the moss or linen stitch. This stitch is a single crochet and a chain 1, with all single crochet stitches worked in the chain-1 space the row below. When color repeats are longer, let’s say 24” (61cm) argyle may not be effective, but you can use other stitches to come up with various patterns. My Planned Pooling Scarf that has just been released by Red Heart Yarn, is worked in a longer color repeats, using a V stitch (a double crochet, chain 1, double crochet) worked in the chain-1 space of the V stitch of the row below. 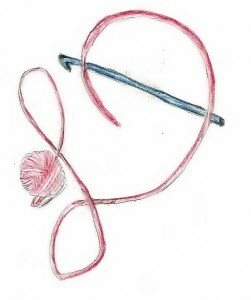 The V stitch uses more yarn then the “moss stitch” and the chain works to help give a little flexibility in getting the color placed in the correct place. (Marly Bird offers great tips in getting the yarn to pool in her video, here). 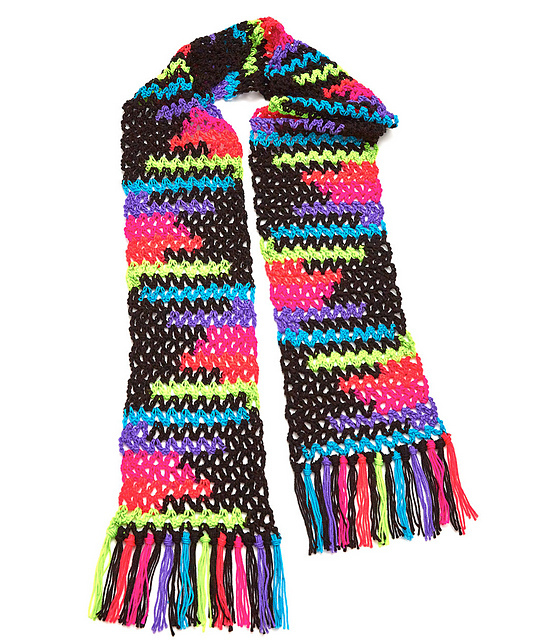 The Neon Stripes color of Red Heart Super Saver offers a really great opportunity to create this large stitch color pattern. 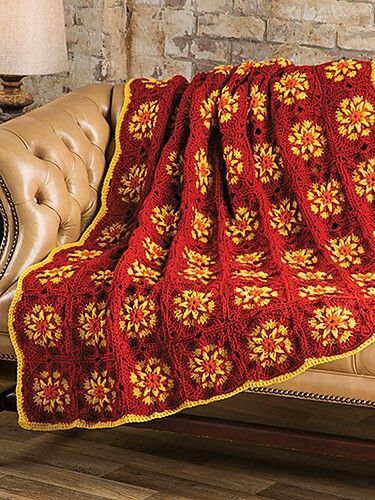 I have also seen this yarn worked up in a pooled pattern with shell stitches, and popcorn stitches. It creates a similar color effect, but a definitely different texture. This design creates a fabric that is a bit lighter than the argyle, which makes for a nice drape, and the color play makes for a very fun flair. The fringe gives it a classic feel, while the pooling is quite modern. Hope you feel inspired to give it a try. 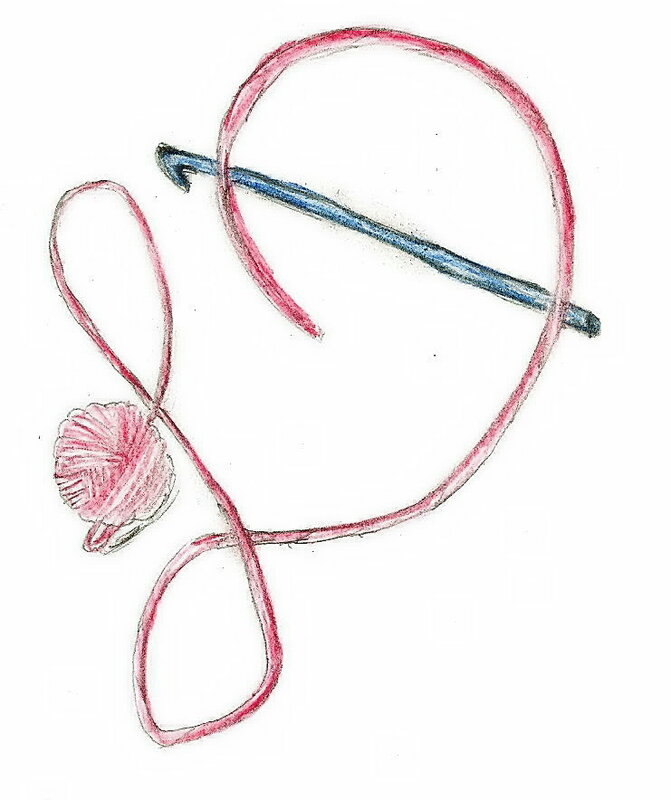 Sometimes you have a design where the yarn does all the work, this means that the stitches may be fairly easy, but since the yarn has character the item really looks more difficult than it is. This is true with color pooling projects, like my latest design Planned Pooling Argyle Wristers from Red Heart Yarns. Planned Pooling is when you plan your stitches to have the colors of variegated yarns stack up in a desired way. I might be exaggerating slightly about it being completely easy, you do have to pay attention to your tension so that you place the correct color in the correct stitch (Marly Bird has a great video about it here). 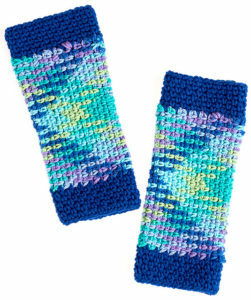 So these wristers look great and keep your arms warm, and only take two skeins (one for the argyle, one for the trim). The argyle is worked in what is referred to as a “Moss” or “Linen” stitch, which is simply a single crochet and a chain 1, worked into a chain-1 space. This stitch has a benefit to planned pooling as it is very forgiving with a change in tension. 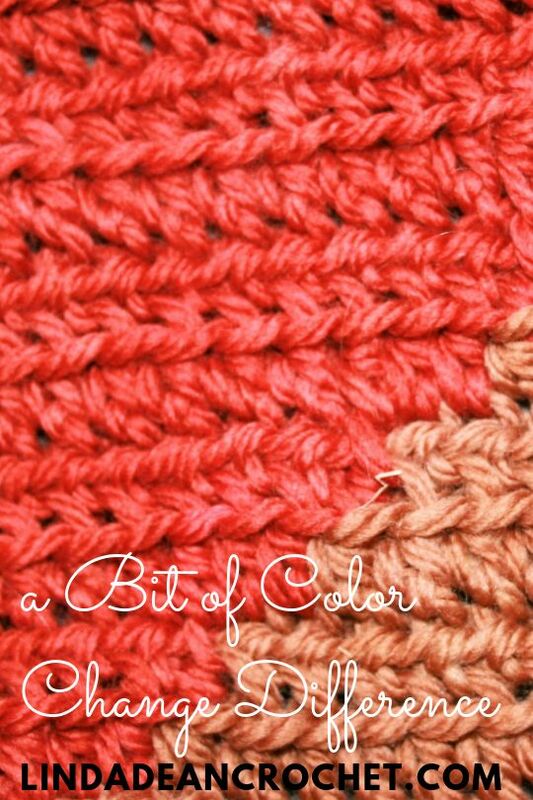 It is necessary to change your tension (either make a stitch tighter or looser) to ensure that the correct color is worked in the correct location. It may take a little practice to get the hang of this technique, but then you might become addicted…I have talked to several people that once they finally discovered how to make the planned pooling work, had to try it with every color variegated yarn they could find, just to see if they could get that yarn to pool too. The wristers are worked as a rectangle then seemed, then the trim is added. If you need the wristers to fit a wider arm you simply work the rectangle longer, if you want the wristers to fit your arm longer then you work the trim wider. 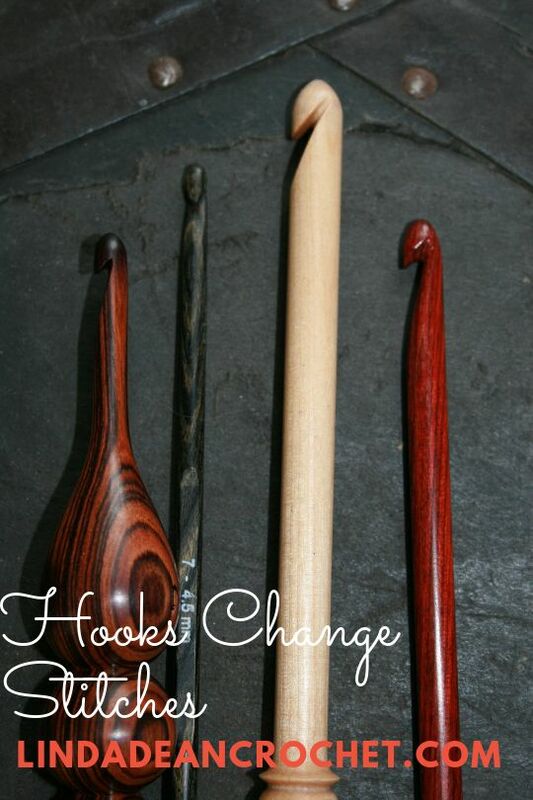 Making it an easy to customize pattern. 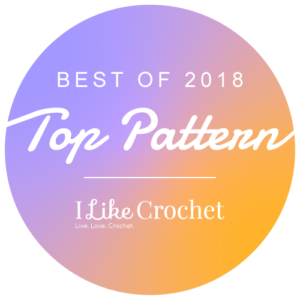 The added bonus to this pattern, besides it being free, is that it is available in a free e-book with 9 planned pooling patterns….and did you notice that my design is gracing the cover? Yes, I think that is kind of cool. 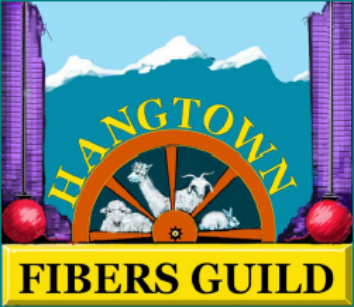 Following the world of yarn can lead to some interesting adventures. Last week I attended the National Needleworks Association (TNNA) winter trade show, which is established to allow yarn, thread, needlepoint, and any other related manufactures and supplies to be in one spot and show their new wears to potential buyers. This show was in Washington D.C. and was as it usually is, a complete whirlwind. I saw many yarns, met many people, and left exhausted and overwhelmed. I hope to see some samples of the products I checked out at my home soon, so that I can get more equated with them, and share my thoughts with you. I was able to meet up with my college roommate for dinner, which was an added trip bonus. I was able to meet his lovely wife, while catching up on old times. Amazing how 17 years can pass between meetings, but we can pick up on conversations like they were yesterday. I also was fortunate enough to take part in a needle works tour of the National Cathedral. I did not get to complete the tour, as I needed to get to the airport for my journey home, but the part that I saw and heard was wonderful. Now this is where the real adventure of my trip began, and definitely made a lasting memory. I got to Dulles airport, and was surprised to find no lines at security, nor real bad traffic in getting there for that matter. Then I learned that my flight to Denver was delayed, first 30 minutes, then an hour, ultimately it was delayed an hour and a half. It was still enough time to meet my connecting flight in Denver, so I didn’t think too much of it, until landing in Denver and realizing my connecting flight to Sacramento was cancelled. I had never had to deal with this in travel, so I guess I cannot complain too much. Myself and Marly as she dropped me at the airport the next morning. Thank you Marly! What a nice unexpected visit. I learned that by the time that my flight landed 30 flights had already been cancelled, and that was just by my airline. Apparently Denver had been under tornado warning most of the afternoon and evening. No hotels rooms were available, and it was well after midnight, so I began to find a quiet place to sleep, under a set of seats, and posts a picture of my sleeping arrangements to Facebook. About an hour later, after getting the usual 15 minutes of possible sleep, I checked my phone to find that a post was made just a few minutes earlier from a colleague and friend asking why I hadn’t given her a call. 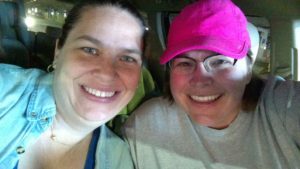 I did not realize that she lived so close to the airport, and after some back and forth, Marly Bird, the podcaster, designer, and Red Heart Ambassador came and picked me up at 2:30 in the morning to give me a few hours of sleep on her sofa. The next morning, I got to see where all the magic happens in her studio before she returned me to the airport to begin my day of travel to Northern California via Southern California. 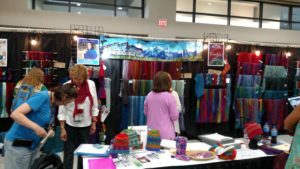 I finally got home the next night, but this trade show showed me more than just some new yarns, it showed me just how generous people in this industry can be. It is definitely a trip I will not forget anytime soon. The interesting thing about ideas is that you never know when they are needed, or used. 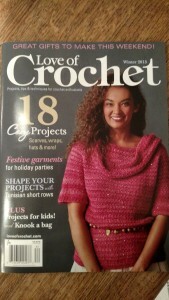 My latest released design, Holiday Sequins Sweater, reminds me of that, its journey was an awkward one, but now it sits on the cover of the Winter 2015 issue of Love of Crochet. I may not have even known that it graced the pages, let alone the cover had it not been brought to my attention by a very compassionate and supportive designer, Marly Bird. She had noticed it, took a picture of the cover and tag me in a Facebook post. The idea for this sweater came to me nearly four years ago as I was swatching with a yarn, which I believe has been since discontinued. I was inspired by a top that my sister had given me that had this cowl type neck, but I was never happy with how it only came to my waist line, it felt to short. I created a sketch to accompany the swatch of a simple texture, and sent it to various publishers, none of which were interested. As the seasons changed I would send it to a couple of other publishers, but it never found the right fit, until I answered a call for designs for a new book that Lorna Miser was putting together. At the time, I had never met Lorna, yet I had heard about her as a local legend. She is the original founder of Lorna’s Lace Yarn, and actually began the business just a couple of miles from me as I was growing up. 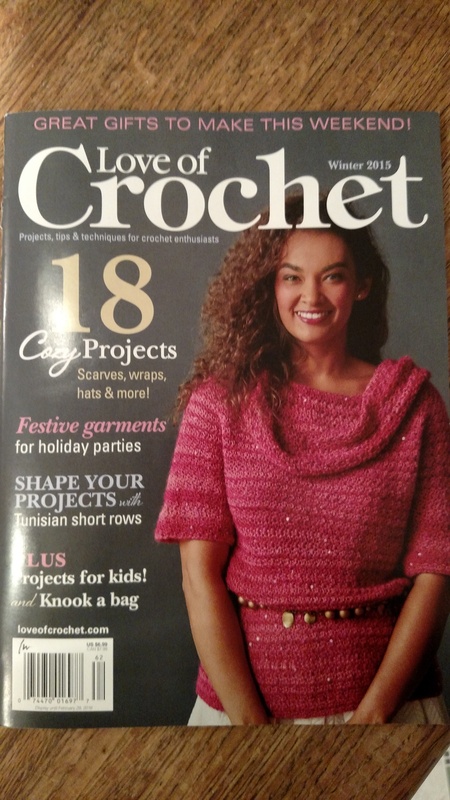 Of course I had no knowledge of this at the time, or frankly the interest, but as I grew older and even began working in the crochet/yarn industry, people would notice my street address and ask if I knew Lorna. That is just how small the world can be, she began the business and grew it for several years literally just down the street from me. 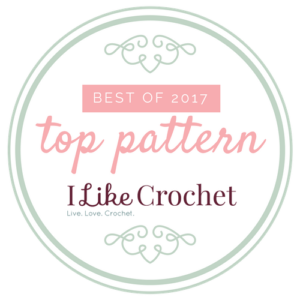 She has since sold the business and is focused on designing, and was putting together a new crochet book, one in which this sweater made to cut for, so the sample was made and the pattern written. The book never made it to fruition, but the design found its way to Love of Crochet, where unbeknown to me it landed on the cover. When the design was conceived I really thought that it was great, but then it was constantly rejected, then I thought it had found its way into an actual hard copy book, to learn that things had shifted once again. It was then possible that it may make it to the light of day, only to then dance upon the cover. This seemingly long journey, which had a couple of twists and turns, just to have a pattern for a sweater, reminds me a little of how things ultimately go in life. You think you are on one path then all of the sudden you are on another and you end up in places that you may not have expected. So as I begin the time of year that has me usually reflecting on the past, looking at where things were a year or two earlier this design will remind me that you never know where the journey might take you. The Final Gift Bag Giveaway! Wow after 4 other giveaways from the gift bag at the Marly Bird Designer Dinner at TNNA Summer Trade Show in Columbus, OH, there is still enough yarn to have 1 more! 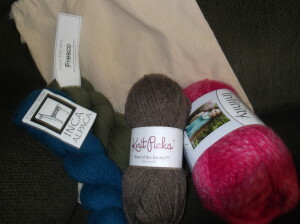 The yarns for the final giveaway all have something pretty special about them. Like the Knit Picks Wool of the Andres. It has a beautiful heather of brown, and is created with 100% Peruvian Highland wool. It is not the softest yarn I have ever experienced, but it has great stitch definition and durability, great for outer ware or accessories. It is easy to see why many people use this as a “go-to” yarn. Red Heart Boutique Infinity definitely is something special as well! It is a chain ply bulky weight acrylic/polyester/wool/nylon yarn. A chain ply is a yarn that is not strands spun together as basic yarns are, it is usually a single strand that worked like a crochet chain or like a knit I-cord. This is a very simplistic explanation, as the process for each company varies, but it should at least give you an idea. It has a little sparkle to it, and will work up quickly. The yarns from Classic Elite Yarns are fitting the title. Inca Alpaca seems lush, with a nice hand and nicely saturated color. 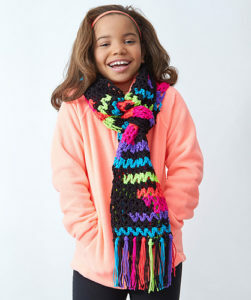 It offers great drape and I image would make some nice accessories, such as a shawl or gloves, maybe even a hat, but it can even work up as a nice sweater. While Fresco is comprised of wool/baby alpaca/angora is a lighter weight and softer than Inca Alpaca. It is quite yummy. They even have their own drawstring project bag, and who does not need another project bag? This last gift bag giveaway definitely has some fun and interesting things to play with, and if you would like to sample the above mentioned, please leave a comment on this post by the end of Friday, July 31, 2015. One comment will be chosen at random with the winner announced the following day on my Facebook page and Twitter.